Chaytor, Henry J. (1933). A History of Aragon and Catalonia. London: Methuen. http://libro.uca.edu/chaytor/achistory.htm. Cingolani, Stefano Maria (2009). 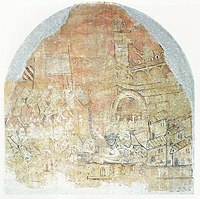 “El comte Ponç Hug V i la invasió francesa de 1285”. Mot so razo 8: 27–40. Pasquier, Félix (1892). “Cession définitive du Val d'Aran à l'Aragon”. Revue de Comminges 7: 101–13. http://gallica.bnf.fr/ark:/12148/bpt6k5759391q/f123.image. Strayer, Joseph R. (1953). “The Crusade against Aragon”. Speculum 28 (1): 102–13. Strayer, Joseph R. (1969). “The Political Crusades of the Thirteenth Century”. The Later Crusades, 1189–1311. A History of the Crusades, Volume, II. Madison, WI: University of Wisconsin Press. pp. 343–75. http://images.library.wisc.edu/History/EFacs/HistCrus/0001/0002/reference/history.crustwo.i0024.pdf.